The Urban Politico: What's Wrong With Rich People? It has always bothered me a little that some rich people don't give much money to charity. It also bothers me that some rich people vote Republican simply to keep their taxes low. I often cringe when I hear about them buying unnecessary luxury items that they can't take with them when they die. I've previously called out Diddy for his epic failure when he purchased his 16 year old son (an unlicensed driver) a $350,000 Maybach for his birthday the same week Haitians were dying on my teevee in the aftermath of the devastating earthquake. The natural response to my thoughts on this topic are, this is America and people are free to spend the money they earned however they want. I don't argue with that. My point is that when new jobless claims have risen to 500,000 this week and 20 million people are displaced and suffering in Pakistan as a result of devastating floods (where relief agencies literally are begging for donations), I can't help but be a little disgusted at an article in yesterday's New York Times where a couple in Tribeca shows off the new aquarium they built in their basement. 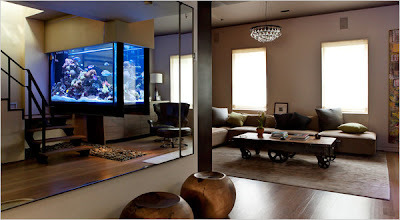 Aquariums of this size and type typically cost a minimum of $50,000 and can go up to as much as $200,000 not including the extra cost of $1,000/month for maintenance. Jobless claims and some rich people's aquarium in their Manhattan loft may seem to have nothing to do with one another but that's where the recent debate over the extension of unemployment benefits and the debate over the Bush tax cuts come in. Republicans want rich people to keep more of their money but the so-called lazy people on unemployment are cut off from benefits they paid for. There is something so wrong with this picture. It's entirely possible that the folks with their expensive aquarium (pictured above) are the most generous givers to charity but all too often the person at the top of the Forbes list of highest earning celebrity or CEO is not the same at the top of the top givers to charity (save Bill and Melinda Gates, Oprah, Brad Pitt/Angelina Jolie, and some others). Guess we'll just wait until the economic impact of people buying expensive water parks for fish in their basement trickles down to those of us less fortunate. Please click here to donate to the relief efforts in Pakistan if you have not done so already. Whatever you can afford even if you aren't exactly living on an aquarium budget.